As with all Triathlon Ontario events; safety is our number one priority. KITCan Series Triathlons are fully sanctioned and insured by Triathlon Ontario. Kids in the 3-5 age category must be accompanied by one parent or guardian through the entire race course. Parents or guardians are allowed to “take turns” or switch places when accompanying the child in each portion of the race. 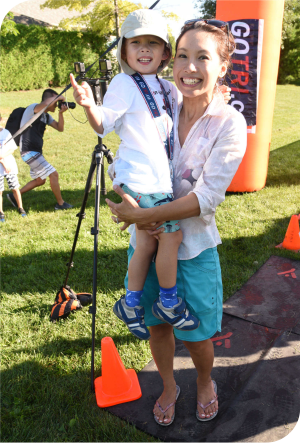 For example, one parent/guardian could do the Swim portion with their child while another parent/guardian waits for them in Transition to switch in for the Bike portion, and then the first parent/guardian could switch back to complete the Run portion and cross the finish line with the child. Please choose what works best for you and your child. Our Volunteer Crew is there to help enforce our Safety First policy. Volunteers will be stationed along the race course and around the event site. Please respect their guidance and don’t hesitate to ask for their assistance. There is a First Aid station run by a trained Paramedic on-site at every race. In the event of a medical emergency, please inform a Volunteer Crew member who will help in obtaining medical assistance from the First Aid station as needed. Athletes must exit the pool area safely as they make their way to Transition. Only parents of the athletes in the 3-5 age category will be allowed in the Transition area during the race. For kids age 6 and up, Volunteers will be present to assist them however needed (i.e. tying shoe laces, buckling helmets, etc.). Athletes must cover their torsos for the Bike and Run portions of the race by either their swimsuits or shirts and also must have their bib numbers attached to the front. Athletes must wear a helmet with a fully buckled chin strap and use a bike that is in good working order for the Bike portion of the race. Kids are allowed to use “Big Wheels,” tricycles, balance bikes, or bikes with training wheels, as long as the equipment is in good working order. If you are unsure about the condition of your child’s bike, we recommend having it inspected by a professional bike shop. Athletes must wear closed-toe running shoes – no other footwear is permitted. Athletes must safely walk their bikes from the Transition area to the start of the Bike portion of the race, where they will be directed by Volunteers and signs for where and when to get on and off their bikes. Athletes must wear their helmets fully buckled at all times for the Bike portion until they have fully dismounted from their bikes at the Bike Drop where Volunteers will take their bikes and helmets for them so that they can begin the Run portion of the race. One parent or guardian must accompany athletes in the 3-5 age category by running alongside them and giving whatever assistance needed to complete the distance. Volunteers are placed along the Bike course for athlete assistance. Once athletes have completed the Bike portion of the race, Volunteers will help them as needed to safely dismount their bikes at the Bike Drop (where directed by Volunteers and indicated by signs) so that they may begin the Run portion of the race. One parent or guardian must accompany athletes in the 3-5 age category by running alongside them and giving whatever assistance needed as they make their way to the finish line. Volunteers are placed along the Run course for athlete assistance. There is a relief station on the course where athletes can obtain water. Spectators must stay off the race course. Please remain within the designated spectator areas to keep the course clear and safe for athletes. If a spectator needs to cross the race course for any reason, a Volunteer must be informed and he/she will ensure a safe crossing for the spectator without disruption to the athletes. Please respect the guidance of the Volunteer Crew and please don’t hesitate to ask for their assistance as needed. Please note the location of the First Aid station when you arrive on race day. In the event of a medical emergency, please inform a Volunteer Crew member who will help in obtaining medical assistance from the First Aid station as needed. 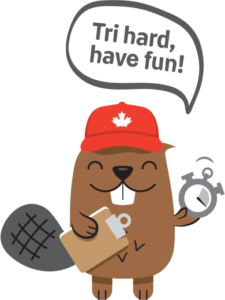 Everyone receives a t-shirt, finisher’s medal and a race kit full of goodies! Come Join us for the Final KITCan Race of 2018!